During the Salone del Mobile 2008, Bisazza presents two striking installations by Andrée Putman and Jaime Hayon at Superstudio Più. The installations, are not only an expression of two totally opposite styles but also of two different generational approaches, the French design icon and the young Spaniard interpret mosaic using their own original, highly distinctive language. In this installation mosaic finds the maximum expression of its great artistic value and versatility in an entirely surprising way. The installations, are not only an expression of two totally opposite styles but also of two different generational approaches, the French design icon and the young Spaniard interpret mosaic using their own original, highly distinctive language. In this installation mosaic finds the maximum expression of its great artistic value and versatility in an entirely surprising way. 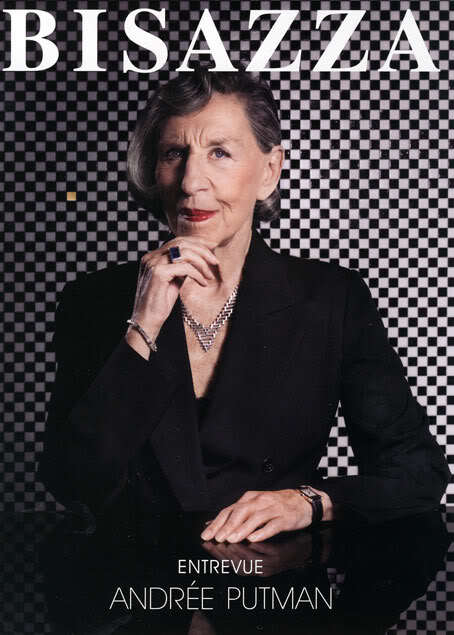 Displaying pure, essential lines, furnishings created for the first time for Bisazza by Andrée Putman – the French darling of design acclaimed around the world – express the sophisticated, unique style which has always been her calling card, elevating her to the status of veritable icon of elegance. 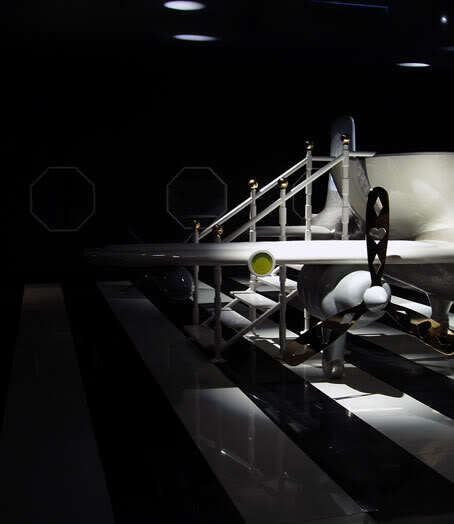 Playful contrast between black and white – a hallmark of many of the designer’s projects – pervades the installation and creates a thought-provoking atmosphere, the perfect setting for pieces with such sophisticated, timeless style. The visitor discovers the Entrevue collection little by little inside a dramatic box, the outside of which is covered with black mosaic tiles while the inside features luminous walls which magically change colour. Invited to explore this space, visitors follow a pre-defined route along a corridor where, in a crescendo of expectations, an enveloping chequerboard mesh resembling a protective net allows glimpses of objects beyond. Inside this setting, the Zenith and Correspondances tables reveal their classic identity through a contemporary look. 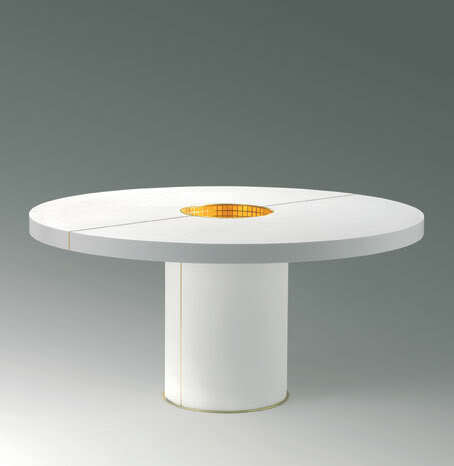 A light source, coming from the gold mosaic, is the element of seduction of Zenith, the round table produced in corian and proposed in two colour versions: white corian with yellow gold mosaic and grey corian with white gold mosaic. For Correspondances, the lacquered wooden writing desk available in four colour versions, the predominant decorative motif is alternating mosaic tiles, each model featuring two contrasting colours: black and white, blue and white, black and grey, each with a single gold tile “set” into the surface. 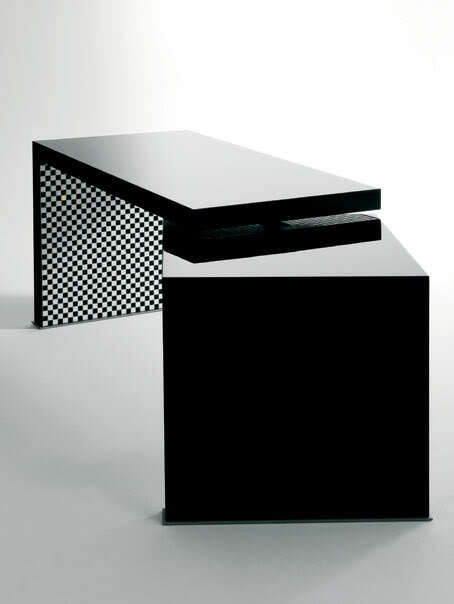 The original arrangement of two overlapping surfaces gives movement and versatility to this item of furniture. 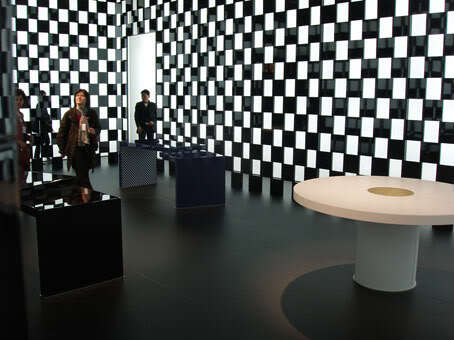 “One can sense a profound, precious energy in the Bisazza family. Their love of precision prevents them from settling for an object that is too overtly “present” and which might therefore detract from other objects close at hand. 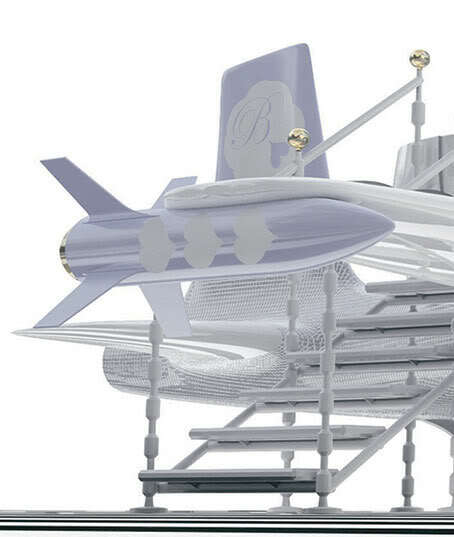 “Entrevue” is a collection for the home which is aggressively ambitious. 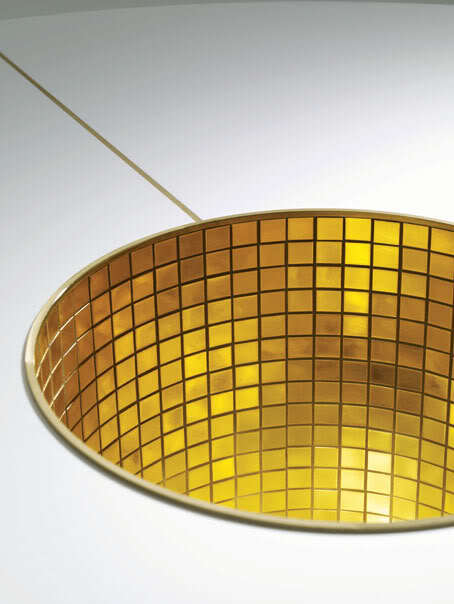 The “Zenith” table miraculously draws on a hidden light source. The “Correspondances” writing desk comprises large, versatile surfaces characterised by an overlap. The atmosphere in the second space dedicated to the project by Jaime Hayon is totally different. The Spanish designer continues his collaboration with Bisazza, still surprising us with his typically flamboyant, Mediterranean creative ability, which reveals his “playful” approach and his fun way of interpreting mosaic. 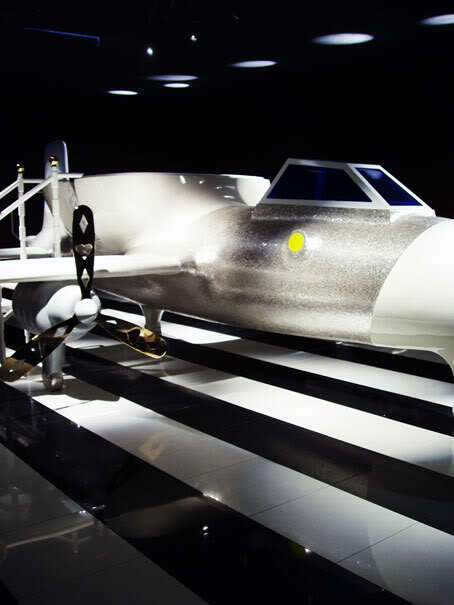 A setting reminiscent of a hangar, totally atypical and chic, hosts a sophisticated “fantasy” aeroplane with a decidedly surreal shape, decorated with white gold mosaic tiles, leather inserts and featuring a neat lounge with padded white sofas. 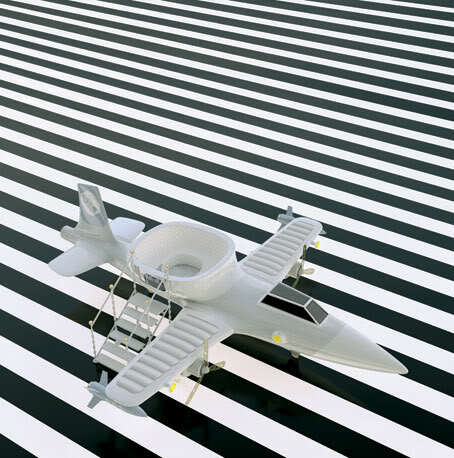 Completing the luxury jet look is a black and white striped floor in Bisazza glass chip mosaic tiles, with interesting reflections between light and shadow creating a movie-set atmosphere. Through playful language, irony coupled with the creative, fantastic flair of Jaime Hayon allows visitors to escape from reality, “diverting them” towards a surreal, poetical world. 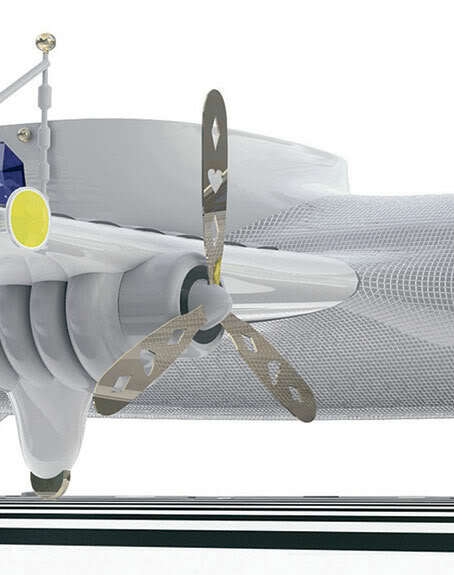 “I like the idea of being able to create a fun, more sophisticated version of an object as serious and functional as an aeroplane. 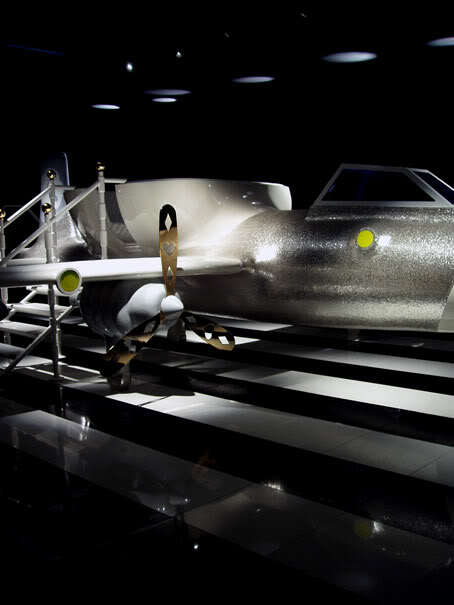 Set in a very glamorous hangar, this aeroplane is a light-hearted work with an unusual and enchanting look, complete with a glass cabin, leather wings and coloured missiles and symbols alluding to love. 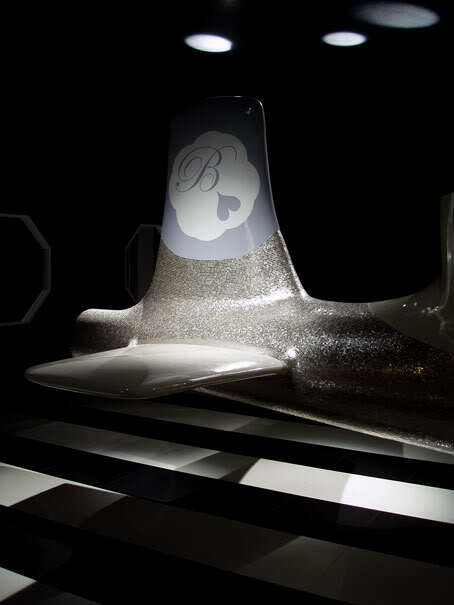 Mosaic tiles in white gold and fibreglass make this aircraft luxurious and surreal. 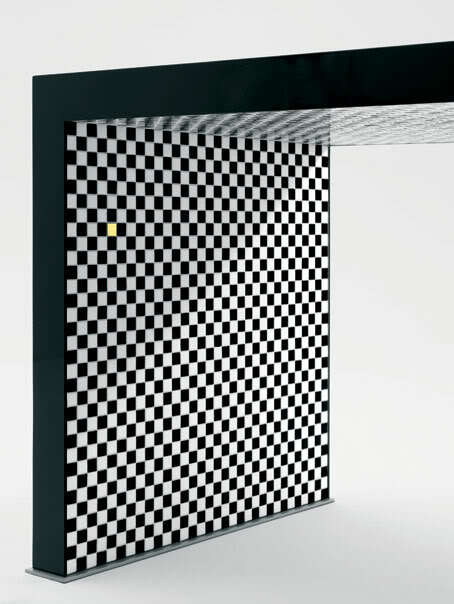 The striped floor in Bisazza black and white glass tiles conveys a feeling of speed and movement. The installation’s spectacular atmosphere, created by the use of reflectors, is reminiscent of a scene from an old Hollywood movie. 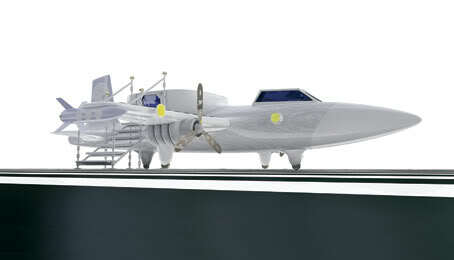 At the heart of the aircraft is a circular lounge. 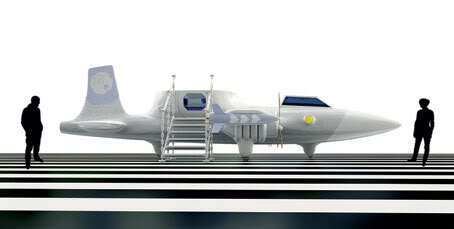 I can imagine this thing flying, with a couple of lovers on board sipping champagne, the atmosphere charged with positive energy and emotions during their flight.